GiftCards.com, online at giftcards.com, is the place to buy gift cards online. 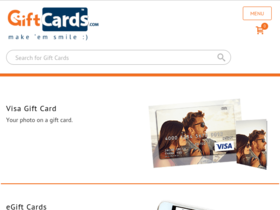 GiftCards.com offers Visa gift cards, plastic gift cards, eGift cards, and more. GiftCards.com carries gift cards for places such as The Home Depot, Amazon, Target, Best Buy, Barnes and Noble, Staples, GameStop, Sephora, Panera Bread, and more. Before shopping at GiftCards.com, be sure to stop by RetailSteal for the latest GiftCards.com coupon codes and deals. Save up to 25% on merchant gift cards at GiftCards.com. Shop gift cards for as low as $10 at GiftCards.com. Shop at GiftCards.com and earn gift card rewards on select purchases. Enjoy exclusive promos with newsletter sign up at GiftCards.com.